Holly Lisle’s How To Write a Novel class is discounted for one week only (1 APR-8 APR 2019). After that week, the price goes up and doesn’t come down, nor does she offer sales later on. If you buy now, you get a rough cut of the class, but any updates are forever FREE afterward. I’ve used her classes before, am working my way through this one now, and love the way she teaches. It’s practical with real exercises, not that theory/feely/zen stuff pushed by a lot of so-called writers. If you were considering taking a class like this, do it now. Disclaimer: I recommend it because I use it, but if you click the link below and purchase the class I will get some compensation. The second reason is ELDER SCROLLS ONLINE. Last week, the Elder Scrolls series of games turned 25. Now, I am old enough to remember when Arena came out, even though I didn’t have my computer with me at the time to play it (I was on active duty then, far from home). 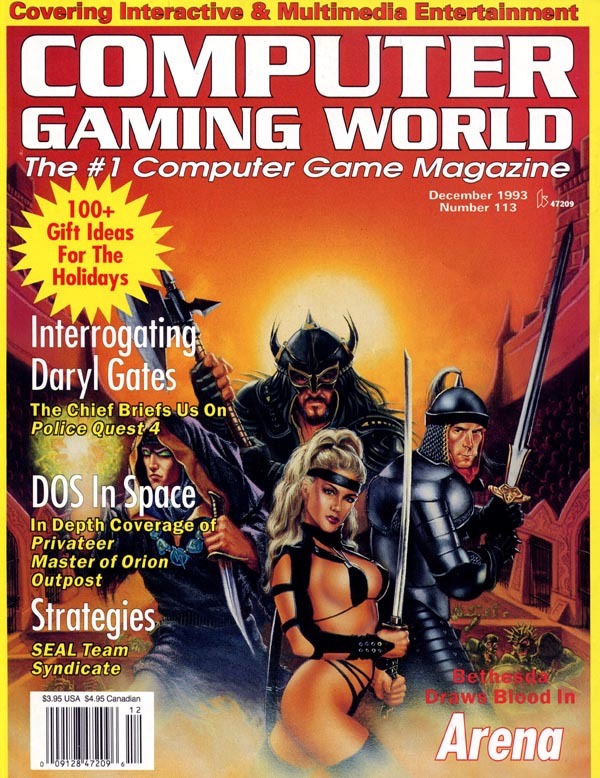 Of course the cover of Computer Gaming World garnered a LOT of attention for the title. I wonder why… I’m guessing that at least one of my brothers still has his copy. To celebrate the 25th anniversary, Bethesda released a free copy of Elder Scrolls III: Morrowind, Game of the Year Edition. I couldn’t have been more ecstatic. While I still have my old copy that I got when it was on the shelves(!!! ), some of the younger members of my family who also love the Elder Scrolls (Skyrim) were able to download it. See? I even have my well-worn, tabbed copy of the strategy guide, which I dug out in order to play it through again. Also free was Elder Scrolls Online this weekend, so I decided to take the plunge (so to speak) and see what all the fuss was about. Now, Morrowind is still my absolute favorite of all of the titles. When it was released, I picked it up thinking, “Hey, this will be fun.” I installed this little gem not expecting anything more than to be entertained with a new RPG. No words can describe how it blew me away. The first beats of Jeremy Soule’s magnificent somber, soulful theme tugged at me like no other music for a video game had, capturing the essence of the character’s experiences and the otherworldliness of the setting (and still gives me the shivers – it’s far better than Oblivion’s “marching” version and Skyrim’s “war-chant” variation). Then I got to see the world – floored again. No trees, all mushrooms! I’m something of a novice mycologist (a “fun-gal”, if you will). Virtually all of the creatures are reptilian (and probably another reason the Dunmer so easily turn Argonians into slaves, thinking them of little higher thinking capacity than their kagouti or guar “cousins”). It was true fantasy, a weird, impossible world that no other game, let alone a first-person role-playing-game got close to emulating. The bizarre architecture where the Imperial Forts are the ones that feel very out of place, the crazy, twisting Telvanni towers, the volcanic ashen lands. Swamps, mines with “glass” and “ebony”. You could LEVITATE – that’s right. Levitate. And you had to, in those towers, but if you were good at enchanting you could add it to anything (you could also do it with the tool…) and cross the whole of Vvardenfel from the air. Just watch out for those face-munching cliff racers. Even Bethesda couldn’t recreate that novel weirdness until the Shivering Isles expansion of Oblivion. The caves under the north in Skyrim start to head that way again, the glowing fungi world with the crimson Nirnroot (it’s name escapes me at the moment). We get a real dose – a real tease, actually – with the Dragonborn expansion and a trip to Solstheim, where some of the fallout from trouble at the Red Mountain made its way over to the Nord-occupied island. And the story! You could, of course, play it any way you liked, but if you go through the main storyline, it feels like you’re experiencing a novel. Humble beginnings, a child born at a certain time of uncertain parents, to discover, and prove, and manifest as the true hero of the story. (Don’t even get to do that in Oblivion, as Martin is the hero and you’re just a tagalong, and in Skyrim, well, everyone is more annoying–oooh, Dragonborn!– than that Arena superfan from Oblivion). In short (or long, as the case here), Morrowind is an almost insurmountable masterpiece. I went into ESO with one major goal – wanting to experience Vvardenfell the way I experienced it all those years ago. Boy, was I disappointed. Don’t get me wrong–the world of ESO is STUNNINGLY BEAUTIFUL (no, I am not apologizing for all caps). But it is compressed. Like a Reader’s Digest version of MW’s Vvardenfell. And it’s not just my memory expanding on me, because I did a quick play-through of getting to Caius Cosades just to test against it, in case it was my old age. Getting from Seyda Neen to Balmora was a trek, and a dangerous one at that. At any moment, one of those horrid little kwama foragers could jump out at you, or a cliff racer swoop in ready to eat your face. There was real danger, real tension that the trip you were making might be your last, before it even begun. Unless you decided to hop in a Silt Strider and make the trip more safely. In ESO it was like, “Head on the path north from Seyda Neen and… oh, there’s Balmora. Um… yay.” Same for Vivec City. And, if along the way, an alit or nix hound happened to attack you, well, dozens of heroes would just by you and hack/slash, no more critter. Yay. Not. There was a heavy dose of isolation in Morrowind that made the world so wonderful. I get that the Vvardenfell of MW was the entire game, and this one is part of a much larger world, but compressing an already-extant world into a peanut shell ruined that part for me. You get to experience it fresh, clean. Not the case with ESO, where everyone is a hero, running around with incongruous names, on mounts that don’t look like they belong in the universe of Elder Scrolls let alone on Vvardenfell (with the exception of the guars, who are awesome looking mounts!). All followed by a bunch of nonsensical pets, which only adds to the off-putting impression. To be “fair”, Bethesda seemed to get away from what made their games awesome with each iteration after MW. In MW, you get to slowly unravel your part in the world. There’s a cryptic dream warning from someone you only much later learn is Azura. In ESO, you get slammed with the knowledge that a Daedric Prince is using you. In MW, you don’t get to meet Vivec until much later in the game. In ESO, you’re chatting like pals after a few short jaunts here and there to serve him (at least there’s the satisfaction that, in MW, you get to end the god-poseur. Gratifying). The other thing that really bothered me was the “prettification” of the characters. I LOVE character creation, especially when there are a whole bunch of sliders to really tweak the look and make them unique. Morrowind had none of that – you selected a race, a gender, a hairstyle and a face. Oblivion had the sliders, but everyone looked like bloated ticks, no matter what you tweaked (I heard that there were mods that improved the look but I never used them). Skyrim did it right and did it wrong – lots of sliders, but the man races all looked alike as did the mer races. I couldn’t tell a Bosmer from an Altmer, despite them being unmistakable in the previous titles. At least in Skyrim, every last one of them looked like they had a hard life, which is realistic. In ESO, everyone is a supermodel version of themselves. Sure, there are some scars and bits of other physical detractors you can add but the orc females are like idealized elves with green skin paint and stick-in tusks. It’s laughable. As if someone ugly can’t possibly be heroic. And before you accuse me of being a hater, first, shut it. This is my opinion, and I am fully aware that ESO is meant to attract the lowest-common-denominator paying players, and builds in the mass appeal with all of the ridiculous things that people who used to flock to WoW and other games like it are expecting. Players that just hack and slash in the world ruin the FEEL that made that world wonderful in the first place. Was it fun? Yes, but not in any way that made Morrowind wonderful, or even Oblivion or Skyrim great games. I think I will stick with single-player games. Hurry up, guys. This gal’s getting old!